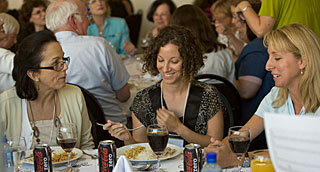 The IAU XXVII GA Women in Astronomy Meeting luncheon was held on Monday 10 August. 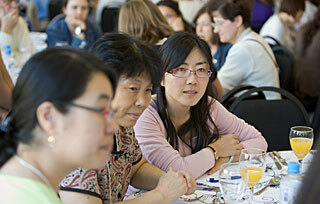 The WAM ran from 12.30 to 2.00pm and all IAU delegates are invited. The meeting was held in the SulAmerica Convention Center, Rio de Janeiro, Brazil. 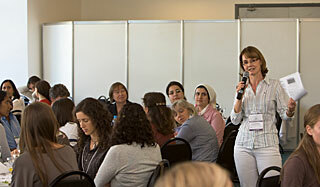 The third working lunch of the IAU Working Group on Women in Astronomy was attended by more than 240 people from over 30 countries, including the IAU Presidents (past, current and future) and about 15% men. The two keynote speakers, Duilia de Mello of the Catholic University of America and the Goddard Space Flight Center and Thaisa Storchi Bergmann of the Instituto de Física-Universidade Federal do Rio Grande do Sul, gave their perspectives of life as a Brazilian astronomer. The speeches were followed by break out groups of 10 who discused various issues over lunch, focusing on strategies that will improve the environment for all astronomers.